Their fries are truly anaemic. Nonstop open, great option for after partytime. 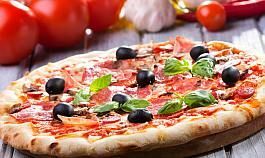 Wide selection of gluten-free pizzas - you'll wait 10min for it, because they make it on order, so it's freshly prepared. Pizza margherita neobsahuje ani bazalku ani mozzarellu, fail. Great pizza when freshly done. I predict this eating establishment will not be here for much longer - just a hunch based on their attitude to customers. I'll never come here again, prices charged higher than menu, 10Kc charge per box (others don't) and then confronted with beligerence by the server when challenged. His response: "I'm not a thief"! Pizza nic moc, ale ve 4 ráno... Hudba končí..
Nedavajte si pizzu, neni dobra a suroviny ze kterych je pripravena nejsou kvalitni a zaroven jich je malo. Pizza nic moc převážně kvůli náhražkám originálních ingrediencí. Za stejnou cenu pořídíte chutnější v Giallo rosa na Jiřáku.